For over 25 years Dent Specialists have been servicing motor dealers to repair dents and dings across Bolton, Bury and North Manchester. We are mobile to the trade, whilst running a dent repair clinic at the BOC showroom Manchester Road Bolton on Saturday mornings for the general public. As part of the original DentMaster team we quickly became the top performing Dentmaster paintless dent removal technicians in the whole of the UK. 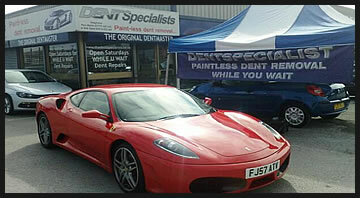 For the last 15 years we have operated our own paintless dent repair (pdr) company in Bolton and Bury. Paintless Dent Removal from £40. Low cost, effective dent removal in Bolton Bury and North Manchester with 25 years experience in the car dent removal business. Our largest customers are new and used car dealers in the Bolton Bury and North Manchester area but a growing number of private and lease car drivers approach us direct to remove car park dents and most minor car body dent repairs, saving £££'s on body shop bills. Paintless dent repair is for minor dents and dings in car bodywork such as doors, wings, bonnet, roof and most other body panels. Call us with a description of the dent and we'll let you know if we can fix it. Call Paul Martin on 07779 660345 for PDR in the following areas: Bolton, Bromley Cross, Egerton, Eagley, Edgeworth, Harwood, Bradshaw, Horwich, Blackrod, Westhoughton, Lostock, Ladybridge, Heaton, Farnworth and Kearsley. Bury, Summerseat, Ainsworth, Tottington, Brandlesholme, Walshaw, Walmersley and Greenmount. Call Rob Yates on 07813 023669 for PDR in the North Manchester area including City Centre Manchester, Whitefield, Prestwich, Stoneclough, Radcliffe, Eccles, Swinton, Salford, Trafford Park, Urmston, Stretford, Chadderton and Middleton. New & Used Car Dealer Accounts Welcome Full Pitch Need Doing? Multi Car Discount Several Dents to Fix?